Thank you to the buyer from Hadley, PA. 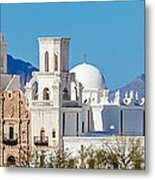 The San Xavier mission is a beautiful old world place, I hope you enjoy this as much as I do. Thank you again, regards, Ed. Elijah, thank you for the congrats. Regards, Ed. Mission San Xavier del Bac shines in the hot sun with hills to the northwest and the blue Arizona sky providing a background. Mission San Xavier del Bac was finished in 1797 and is the oldest European structure in Arizona. 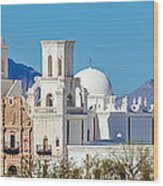 Located just south of Tucson in the Tohono O'odham San Xavier Indian Reservation, the mission has served as a community and spiritual center for the Tohono O'odham people and has drawn thousands of pilgrims yearly that come to pray to Saint Francis Xavier. 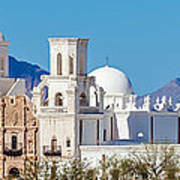 The San Xavier mission was declared a National Historic Landmark in 1960. Note: This image does not have a model or property release. © Edward Gleichman, All Rights Reserved.